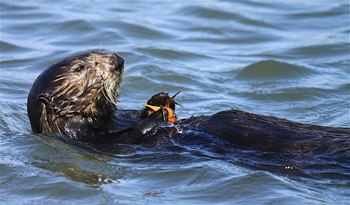 When a sea otter wants to rest, it wraps a piece of kelp around its body to hold itself steady among the rolling waves. Likewise, California's sea otter numbers are holding steady despite many forces pushing against their population recovery, according to the latest field survey led by federal, state, and UC Santa Cruz scientists. Since the 1980s, U.S. Geological Survey scientists have calculated a population index each year for the southern sea otter (Enhydra lutris nereis), a species federally listed as threatened. For 2014, USGS reports the population index as 2,944 (data available online). It's a negligible bump from the 2013 report of 2,939. For southern sea otters to be considered for removal from the threatened species list, the population index would have to exceed 3,090 for three consecutive years, according to the Southern Sea Otter Recovery Plan established by the U.S. Fish and Wildlife Service. 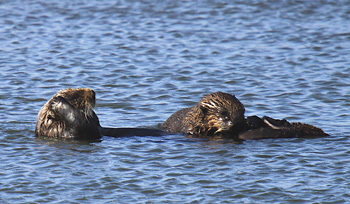 "For an animal so few in number, sea otter population trends can be influenced by many local and range-wide factors," said Tim Tinker, a biologist with UC Santa Cruz and the USGS Western Ecological Research Center who leads California sea otter research with co-investigators from UC Santa Cruz, the California Department of Fish and Wildlife's Office of Spill Prevention and Response, the Monterey Bay Aquarium, and other institutions. "We are seeing elevated mortality suggestive of food resource limitation in some parts of the range, and increasing mortality from white shark attacks in others. But our federal, state, aquarium, and university sea otter research alliance is making progress in understanding how all these trends relate to environmental factors along the California coast." California sea otters feed and live in the "nearshore marine ecosystem"—the stretch of ocean along the shoreline—making them a good indicator species for detecting pollutants and pathogens washed down from coastlands. Along many parts of Pacific North America, sea otters play critical roles in natural food webs, keeping important ecosystems like kelp forests and seagrass beds in balance. Studying sea otters, then, not only helps us understand their population recovery, but also uncovers clues on the health and rhythm of nearshore marine ecosystems—the same waters many people swim, fish, and make a living in every day. Sea otters were presumed extinct in California after the 19th century fur trade years, but were rediscovered in the 1930s by the public, when as few as 50 animals were documented persisting in nearshore areas off the coast of Big Sur. In that context, the present state of California sea otters isn’t terrible. But population recovery has been slow. Part of the reason is the extreme, edge-of-the-knife life history of sea otters. Not equipped with blubber like whales and seals, sea otters must rely on their fur coat and their super-high metabolic rate to stay warm. "The average adult sea otter has to actively hunt and eat 20 to 30 percent of its body mass in food each day just to meet its energy requirements," Tinker said. Research led by UC Santa Cruz scientists and published earlier this year measured how this energy demand changes for a nursing mother sea otter, who has to eat not only to keep herself alive but also to produce milk for her pup. Researchers calculated that a mother sea otter has to nearly double her energy intake to keep herself and her pup fed—she has to find enough groceries and eat for two, so to speak, for six months straight. Indeed, researchers have documented a high mortality rate among prime-breeding-age female sea otters in California from what they call "end-lactation syndrome"—when females are so underweight and energetically stressed after raising a pup that they are more vulnerable to life-threatening diseases and infections. 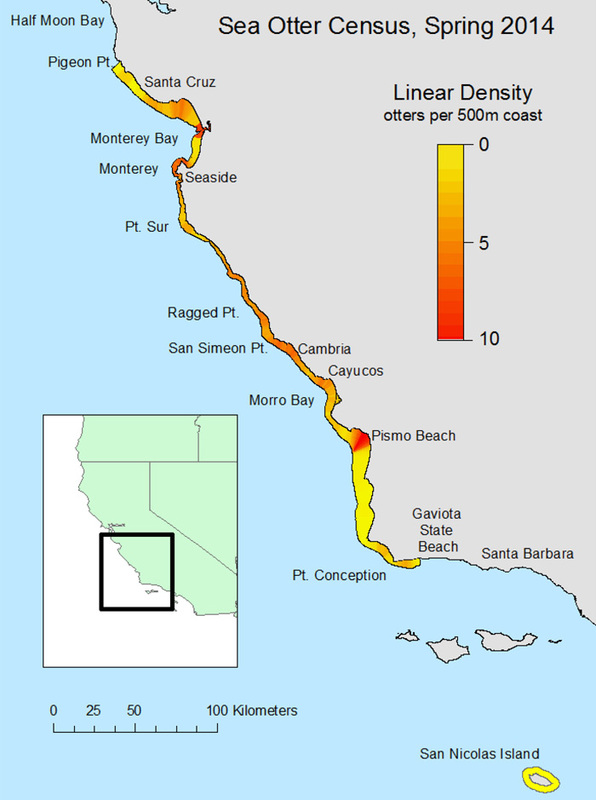 The new research offers an explanation for the high mortality in breeding-age females in the center part of the sea otter's California range (Seaside to Cayucos), which is likely at or near "carrying capacity," the maximum population size that can be sustained over the long term by the resources available in the area. "These fundamentally high energy demands are likely the underlying reason why we see so much mortality among prime-age females in the middle of their geographic range, where the density of the sea otter population is highest and resources are limited," explained UC Santa Cruz biologist Nicole Thometz, who led the study. "In the center of the range, they appear to be up against their physiological limits." But give even more credit to these sea otter moms: the 2014 population index also reported a record high for pups. "The ratio of dependent pups to adult otters remains high overall, and together with data from tagging studies, that tells us that reproductive rates are within the normal range and not limiting recovery," said USGS biologist Brian Hatfield, who coordinates the annual population survey. Of course, it remains to be seen whether more pups will translate into overall population growth. Hatfield also coordinates a yearly review of sea otter strandings—the number of dead, sick or injured sea otters recovered along California's coast each year, including those reported by the public to researchers. In 2013, scientists came across a total of 340 stranded sea otters—a slight drop from 2012 but still remarkably high. However, Hatfield points out that the stranding number accounts only for sea otters that people find, and past research indicates that possibly fewer than 50 percent of sea otters that die in the wild wash ashore. For the sea otter carcasses that do get reported, a subset is sent to the state's Marine Wildlife Veterinary Care and Research Center in Santa Cruz, where scientists conduct necropsies to determine the primary causes of death and to identify other factors that may have contributed to the death of each animal. These necropsies are how scientists learned about the increase in bite wounds from great white sharks—apparently the result of "exploratory bites" that do not lead to consumption of the otter by the shark, but that nonetheless often result in the death of the otter. This cause of death has been common at the north end of the range (from Pigeon Point to Seaside) for some time, but in recent years it has become most intense in the southern end of the range (from Cayucos to Gaviota)—to the point where the adult population there now has a declining trend. Not great news for the dense patch of otters stuck in the central range, trying to expand northward and southward. The state lab has revealed many other causes of death as well for sea otters across California. Over the years, California state veterinarians have found sea otters poisoned by the microbial toxin microcystin—which can flow into the sea after blooming in warm lakes with an overabundance of nutrients—as well as sea otters infected with protozoan parasites that can cause fatal brain infections, including Toxoplasma gondii, which is transmitted by the feces of wild and domestic cats. Other known sources of California sea otter mortality include bacterial infections, heart disease, mating trauma from aggressive male sea otters, boat strikes, and gunshots. Even today, the U.S. Fish and Wildlife Service has an unsolved case from 2013 of three sea otters found near Monterey, California, where gunshot was determined to be the cause of death. That's a lot of different factors determining the survival of a creature central to the survival of giant kelp forests—the underwater jungles teeming with marine life that stretch from California to Alaska. 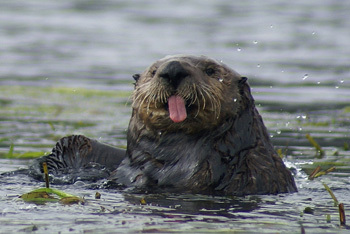 "Sea otters are considered a keystone species of the kelp ecosystem because they are such voracious predators, and they are uniquely capable of limiting herbivorous invertebrates like sea urchins that, if left unchecked, can decimate kelp beds and the fish habitat they provide," said Tinker, who coauthored a 1998 study that described this epic circle of life in Alaskan waters with his mentor Jim Estes, a professor of ecology and evolutionary biology at UC Santa Cruz. The alliance of USGS, U.S. Fish and Wildlife Service, state, aquarium, and university researchers is continuing to study the ecological and environmental indicator roles that sea otters can play, not only in kelp forests of the outer coast, but in protected tidal estuaries as well. Over at the NOAA Elkhorn Slough National Estuarine Research Reserve, alliance researchers have two ongoing studies. One study, also led by UC Santa Cruz researchers, has revealed evidence that sea otters help restore seagrass beds by keeping crab populations in balance, which in turn lets sea slugs thrive and munch on algae that would otherwise smother the seagrasses. Another study is investigating how otters use tidal wetland habitats—where they may benefit from the rich food sources of estuaries and teh ease of resting in warm shallows and sun-bathed marshes—helping us understand how sea otters might one day recolonize and balance similar habitats found elsewhere in California. 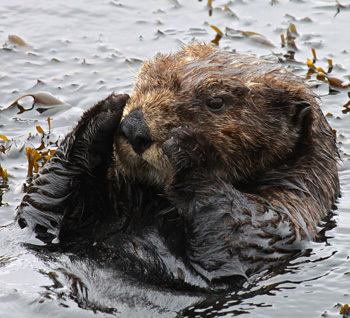 As for the sea otter numbers in California, USGS and alliance researchers are currently analyzing more than a decade of research to tease out the driving factors tempering their population recovery and spread—a recovery, as new findings continue to show, that should benefit California's nearshore marine ecosystem. “We already knew that sea otters played a vital role in coastal ecosystems, but the exciting discoveries of the last several years suggest that we have really only begun to understand the far-reaching effects of this top predator," said Lilian Carswell, Southern Sea Otter Recovery Coordinator for the U.S. Fish and Wildlife Service. "If sea otters can recolonize new areas of their historic range, we are almost certain to see an upswing in population growth. That will be good for sea otter recovery, good for the nearshore environment, good for all of us—because we all benefit from the services that intact ecosystems provide." The annual population index is calculated using visual surveys conducted along the California coastline by researchers, students, and volunteers from USGS, UC Santa Cruz, California Department of Fish and Wildlife, Monterey Bay Aquarium, U.S. Fish and Wildlife Service, U.S. Bureau of Ocean Energy Management, and Santa Barbara Zoo.